‘Game of Thrones’: What’s the Deal With That Dagger? Game of Thrones is not making things easy for us. We already have to remember which beard guy is which, and whose ancestors swore what kind of oaths to whom. And now we’re expected to follow some business with a dagger? What is this, an Agatha Christie mystery? Littlefinger told Bran that the dagger was the thing that started the War of the Five Kings in the first place, and he isn’t completely wrong: After Littlefinger fingered Tyrion as the dagger’s owner, Catelyn jumped at the chance to take him prisoner, which led to Tywin’s invasion of the Riverlands, and now a few years later the realm is in chaos and a whole bunch of people are dead. I’m sure that there’s a maester somewhere who’ll tell you that’s too simplistic an explanation — Cersei was always going to kill Robert, and once that happens Stannis and Renly are going to shoot their shots, so war is pretty much inevitable — but we’re getting off the rails. The dagger is important, that’s all you need to know. Just How Hard Is It to Kill a Dragon? Now, the thing about Tyrion being the owner of the dagger was most certainly a lie; Littlefinger just said that to stir up tensions between the Starks and Lannisters. (In the books, Littlefinger says Tyrion won the dagger from him after Jaime lost a joust, and multiple characters figure out he’s lying because Tyrion never bets against Jaime.) In Sunday’s episode, Littlefinger told Bran he doesn’t know where the dagger came from. Even if this is actually the truth, he doesn’t fess up to everything he knows about the weapon, so zero points to House Baelish. If you’re curious, book readers actually have a pretty good idea about the solution to the attempted-murder mystery, as the Lannister brothers put the pieces together in A Storm of Swords. Tyrion knows it wasn’t his dagger and he’s pissed at Littlefinger for saying it was; later, Jaime remembers that the knife actually belonged to Robert. Then, at Joffrey’s wedding, the young king makes a joke about being familiar with Valyrian steel, which is enough for Tyrion to deduce that he stole the dagger from Robert and gave it to a random lowlife to kill Bran. Unfortunately, Tyrion figures this out just before Joffrey cuts into that fateful pigeon pie, so there isn’t much closure for anyone. As for motive, Jaime remembers Robert saying something about how it would be better if Bran died in his coma, and he figures the assassination plot was Joffrey’s weird attempt at impressing his dad. Even before the war, he was one messed-up kid. The show probably won’t go into that much detail about the dagger’s history, but considering how much attention it’s receiving — John Bradley (who plays Samwell Tarly) says he was told to linger on an illustration of it in the season premiere — it’s fair to assume it’ll play some role in the future. Might it be the piece of evidence that finally leads to Littlefinger’s downfall? Or, since it ends up in Arya’s possession, will our favorite assassin get to try out those water-dancing moves on some White Walkers? 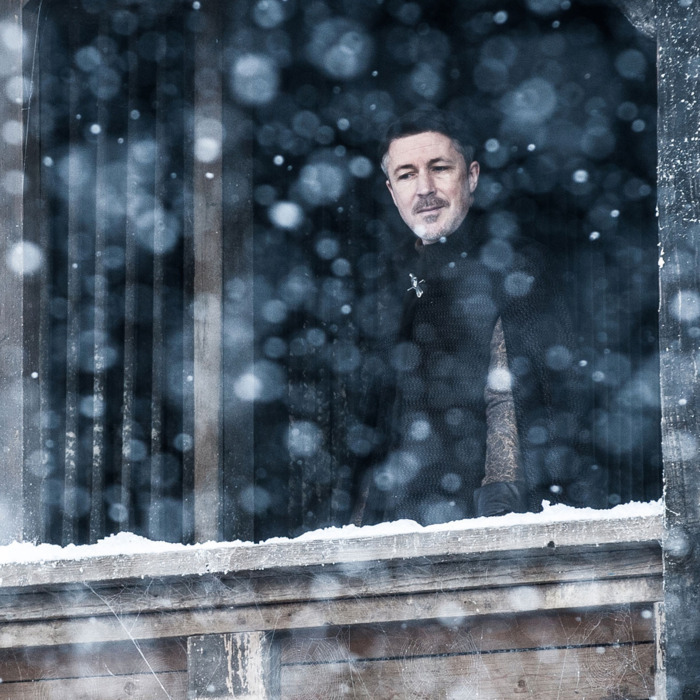 No matter what happens, you can bet there will be at least one scene of Littlefinger standing above the courtyard looking enigmatic about it.